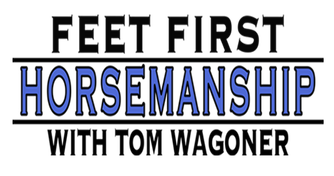 Tom Wagoner, FOunder of "feet First Horsemanship", has over 40 years of experience starting young horses and assisting others in polishing their horsemanship techniques. Tom now travels the country sharing his knowledge and unique ability to help people and horses communicate from the ground to the saddle. "TOM FOREVER CHANGED HOW I INTERACT WITH MY HORSES. NOW I'M AWARE OF MY HORSE'S FEET AND HOW TO COMMUNICATE MORE EFFECTIVELY TO GET THE RESULTS I WANT. TOM IS AMAZING." Contact us today to inquire about participating in or hosting a Colt Starting or Horsemanship Clinic in your area! Ask about our Host bonus program.